A new Grow North series for 2018 opened on Sunday 11 March with a "Getting Started" workshop led by Toni Clarke and Maggie Wormald. Grow North is a series of workshops for those new to growing and the more experienced, offering a chance for guidance from experienced tutors and hands-on practice, together with opportunities to meet and exchange tips and share ideas with others. View and download the Grow North 2018 programme . For more detail on a workshop check the Events calendar or this website page nearer the date. Notes on workshops which have taken place are available on the Training notes page. A stranded willow hoop which will last for years and can be made into a beautiful Christmas wreath using a variety of hedgerow and garden materials. 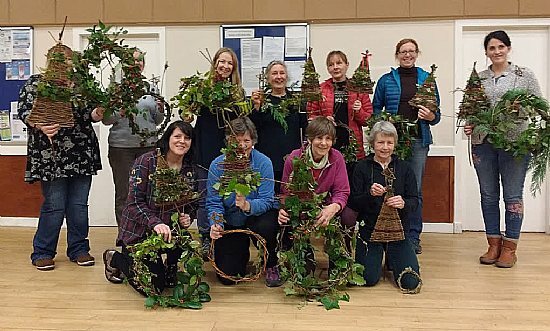 Participants in the Christmas Willow Decoration Workshop show their trees, stars and wreaths. Find out how to make them here. Most of us who grow our own veg understand the concept of composting...recycling our garden and kitchen waste to be re-used on the garden after some time has passed and it has rotted down. I've been a random composter for years, chucking stuff in the compost bin and hoping for the best. So, Saturday's Grow North workshop at Netherton Community Garden on composting was a great opportunity for me to learn how to compost less randomly, and hopefully more successfully as a result. A group of eight of us gathered in the garden on a breezy autumnal day. Helen and Brian shared information with us on hot and cold composting as well as on making leaf mould, and had us take part in a few hands on practical exercises as well. I learned quite a few tips about composting that I will be able to put into practice right away, including the utility of having a shredder (something now on my Christmas list! ).